“Discoball” – is one of the most famous sculptures of antiquity. In addition, this is the first sculpture that depicts a man in motion. At that time, it was very difficult to convey such complex movements in sculpture. The age of this sculpture is about two and a half thousand years. The original of this statue has not survived to date, so we can only see copies. They are made in the period of the Roman Empire. It is known that the original sculpture “Diskobola” was lost during the Middle Ages. The statue depicts a disk thrower at the moment of sweep before the throw. The figure glorifies the ancient Greek disk throwers. We see a naked young man who leaned forward, throwing a disk. His hand throwing a disk is strained and stretched to the limit. 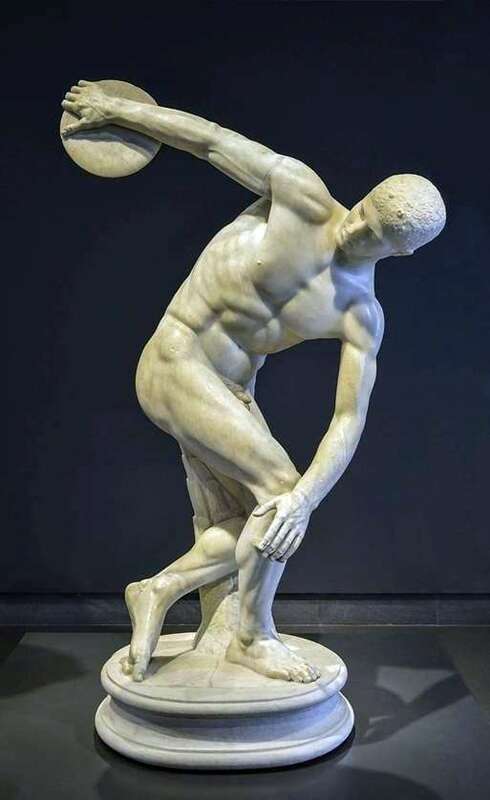 The sculptor depicted the readiness for movement in this figure: it seems that the young man is about to throw a disk with tremendous force, and he will fly a long distance. The young man has very tense muscles. The sculptor was able to show the beauty of the human body, as well as, however, convey the beauty of this movement in this beauty. Myron conveyed all the variety of movements that a person makes. However, all these movements are fused together in sculpture. The simplicity of the gestures of the person depicted in the figure enhances the feeling of lightness and realism of movement. Myron very simply portrayed and connected tension and beauty into one whole, and decorated the human silhouette with closed lines. So he showed that any person is capable of active actions and that a person is, first of all, beautiful. Copies of Diskobol are kept in many museums around the world and are well preserved. Interestingly, this sculpture is adopted as a symbol of the Olympic movement of modern times. This emphasizes its connection with ancient times and traditions.